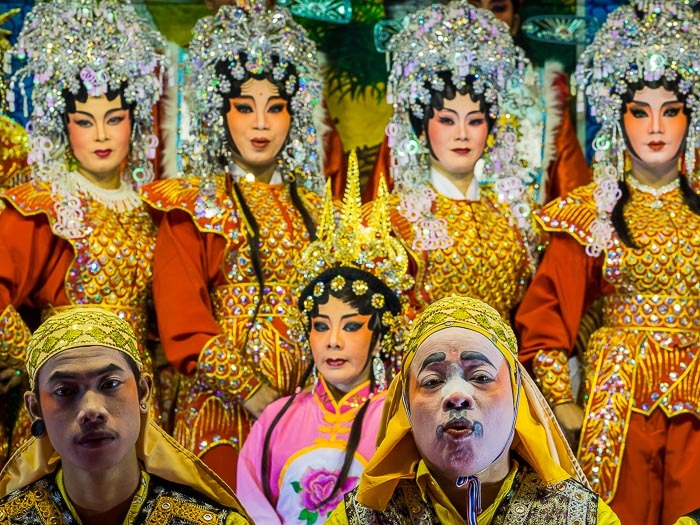 Performers with the Sai Yong Hong Opera Troupe get into their costumes before a performance at the Chao Mae Tubtim Shrine. 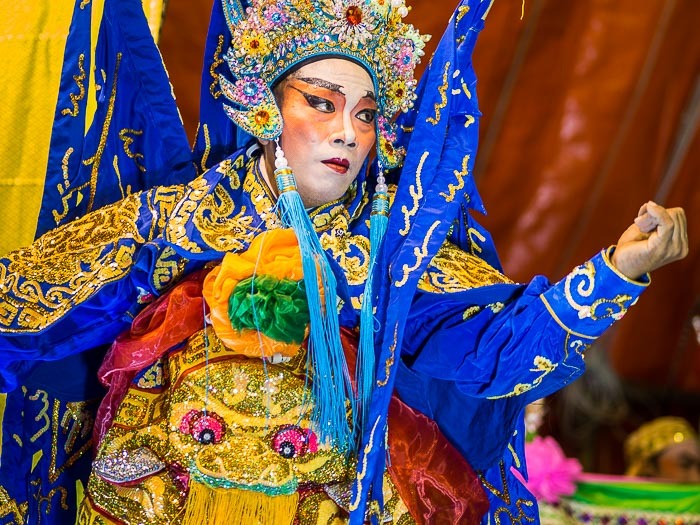 I've photographed a lot of Chinese opera in Bangkok and last night I photographed another one. 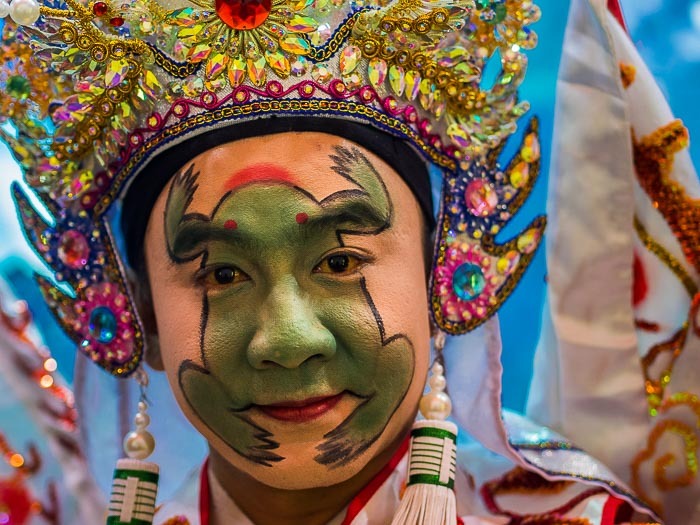 As the Lunar New Year (also called Chinese New Year or Tet) approaches, Chinese opera troupes throughout Bangkok find themselves in demand. 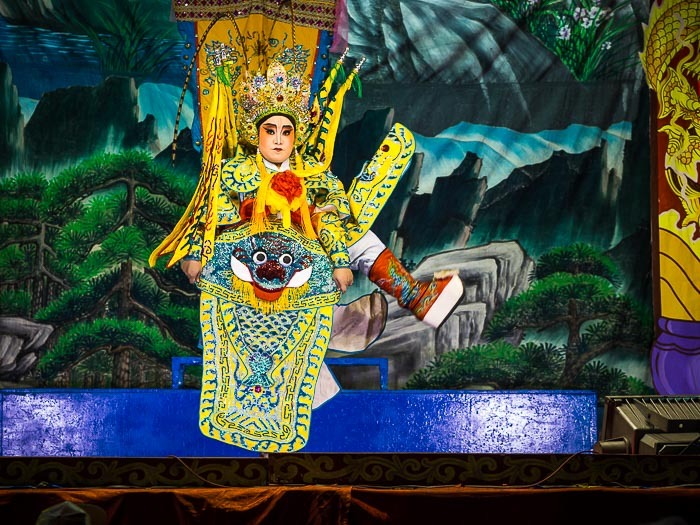 Chinese (or Teochew) opera doesn't exactly have a high season, but there are times of the year that operas are easier to find. Around Lunar New Year is certainly that time of year. Chinese operas are pretty common in Bangkok during this time of year. One of my favorite places for Chinese opera is the Chao Mae Tubtim Shrine on the Chulalongkorn University campus. I've been exploring the neighborhood for years. Taxis and tuk-tuks frequently use it as a shortcut between Hua Lamphong train station and MBK shopping center. A performer ready to go on stage. The shrine, in the heart of the neighborhood, is tiny but busy. It hosts several operas through the year. I like going to operas here because they're the way I always thought a Chinese opera should be. The stage blocks the street, people come and go into the shrine to pray during the performance, food vendors set up on surrounding streets and people from the neighborhood come out for the show. It's not exactly a party but it is a good time. 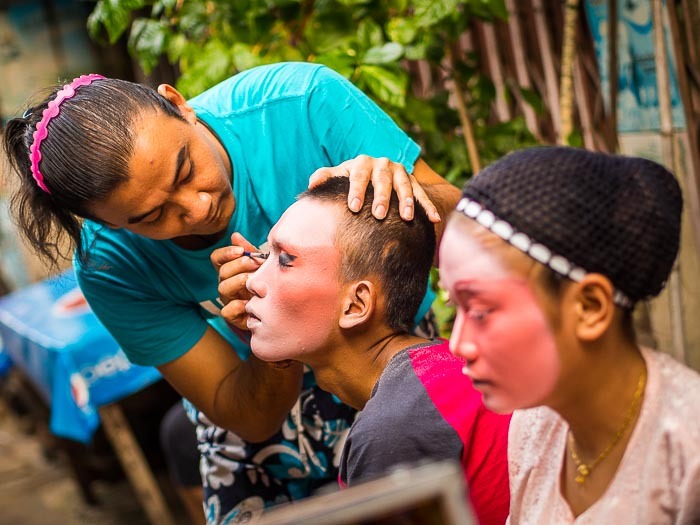 Performers help each other put their make up on. There are no dressing rooms, performers get made up on tables on the sidewalks around the stage. But change is inevitable, especially in a city like Bangkok, that seems to reinvent itself every generation. The land in the neighborhood is owned by Chulalongkorn University, one of Thailand's most prestigious universities. Thousands of people used to live in shophouses in the neighborhood. They lived above their businesses on the ground floor. It was blocks and blocks of shophouses. Chula U has decided they can make more money with high end housing and retail space. Block by block, the old shophouses are being torn down. The neighborhood is being gentrified. 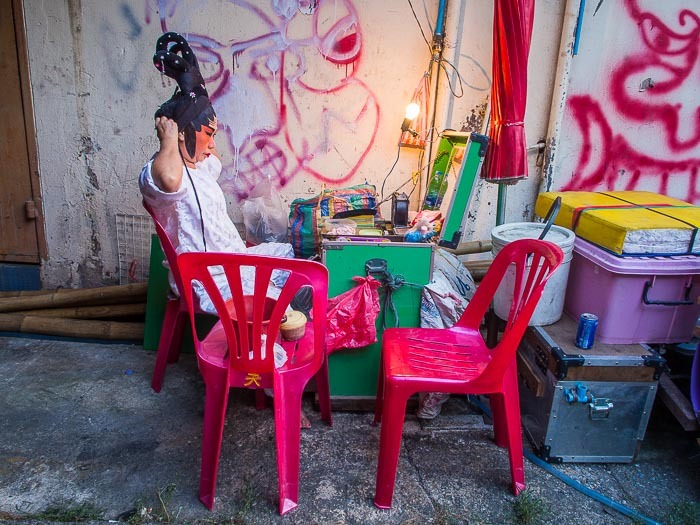 A woman gets ready at her make up table, which is on a sidewalk near the stage. 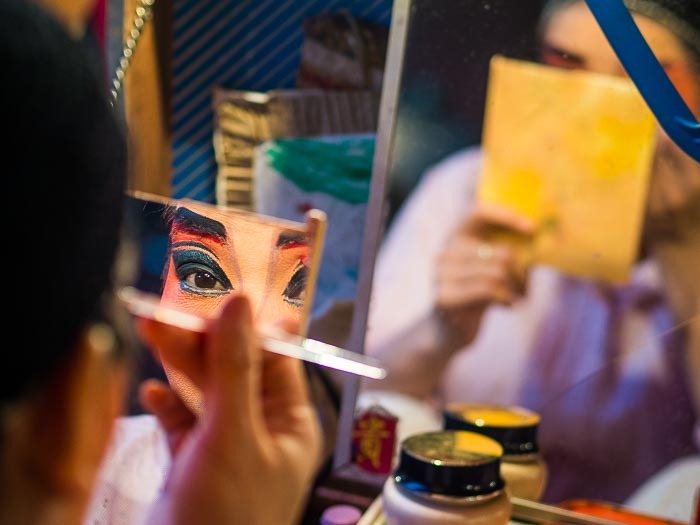 A performer uses a small hand mirror to put on her make up. 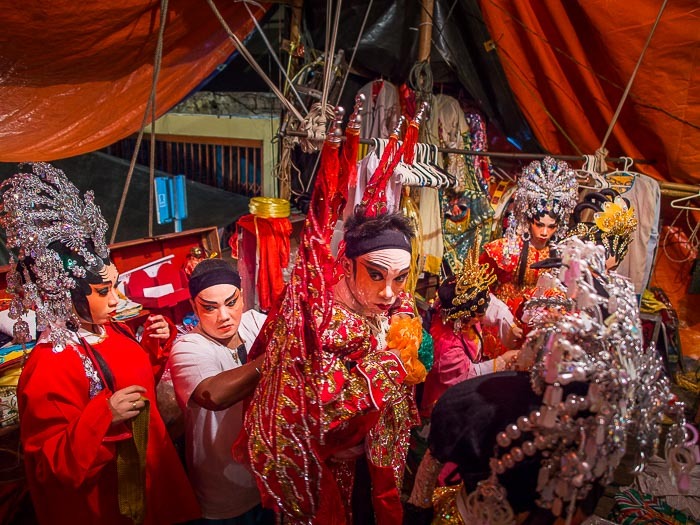 This maybe the last year for the operas at Chao Mae Tubtim shrine. In years past there were two operas at the shrine, performing at the same time. They had a sort of battle of the bands vibe going. 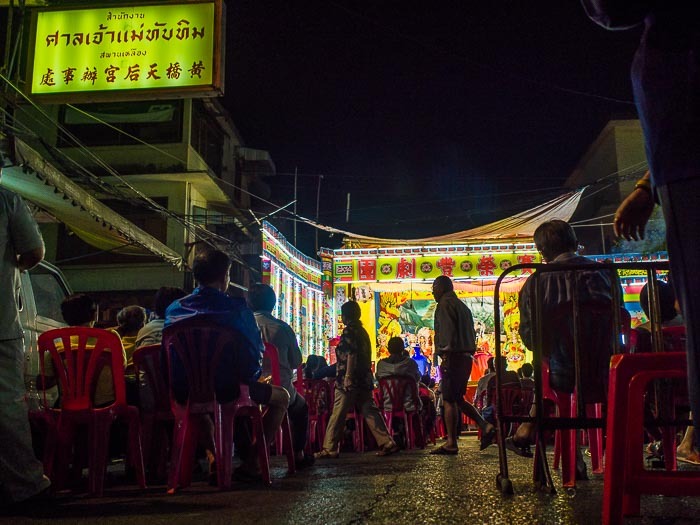 This year, they could only set up one stage because all of the shophouses north of the shrine have been destroyed and the people forced out. It is now a construction site for high end shopping and exclusive apartments. There is already a nearby restaurant complex (which houses a Starbucks, Au Bon Pain and Baskin-Robbins Ice Cream). A performer dances across the stage. One of the male leads. This is the third opera I've photographed at this shrine. Every time I go to an opera here, I expect to be the last time. But this year is different, it feels final. Last year there were two operas and a movie being shown all at the same time. This year just the one opera. People walk into the show. There are more photos from the opera in my archive or available from ZUMA Press. If you're in Bangkok and would like to attend this opera, it's at the corner of Chula Soi 7 and Chula Soi 28. It's scheduled to run until January 24.